Passionflower, also known as ‘passiflora,’ is a perennial climbing vine with a beautiful flower. It has long been used as traditional herbal medicine, with leaves, stems, and flowers made into a tea or a tincture, or powdered and put into capsules. The rather special name of this flower and its striking appearance have lasting mystical and religious significance, as the flower is said to depict the crucifixion of Jesus Christ on the cross. Passionflower works by increasing the levels of a chemical in the brain called gamma-aminobutyric acid, also known as GABA. This chemical reduces anxiety and encourages relaxation by diminishing the activity of certain brain cells that play a key part in depressive states. Passionflower extract was found to lessen anxiety in patients about to undergo surgery, indicating that it is highly beneficial in times of acute anxiety. As with the previous study, not only did passion flower lessen anxiety at a time of great stress, but it had no unwanted side effects and patients were able to operate at their normal capacities. Passionflower has been a folk remedy for anxiety for generations, and contemporary research is now backing up the potency of passionflower. Its strong calming effects have been studied by scientists investigating generalized anxiety disorder. They discovered that passion flower extract was as effective in relieving the symptoms of anxiety as a conventional sedative, but unlike the sedative, passion flower didn’t cause any impairment to the patient’s ability to perform their job. From the compelling evidence of passion flower’s calming powers illustrated already, you’d be right in imagining that it is also a good aid when you need a helping hand sleeping. A recent study confirmed that drinking passion flower tea helps in improving and stabilizing the quality of sleep, so drinking a cup of this tea before bedtime will ease you into a more restful night. Another beneficial attribute of passionflower is that in tandem with reducing anxiety and encouraging good rest, it can assist with cases of mild hypertension and help to lower blood pressure. A 2013 study concluded that anthocyanin antioxidant compounds and a compound in passionflower called edulilic acid were responsible for reducing elevated blood pressure levels. Another study from the same year showed that passionflower extract increased antioxidant enzymes and decreased levels of oxidized lipids that had been damaged by toxins in the body. An herbal extract may help to reduce high blood pressure. For those who are struggling with mild levels of hypertension, drinking a cup of passionflower tea every day may help to regulate blood pressure levels as part of a healthy lifestyle. Passionflower is also a great ally for women who are going through the menopause. As estrogen levels drop during the menopause, some women experience irritability, depression, and difficulty sleeping. Scientific studies have shown that passionflower is a good candidate for women who cannot undergo hormone therapy. It is also a good remedy for those who simply prefer to choose a more natural route. You can find this beneficial flower in two of our premium natural supplements. 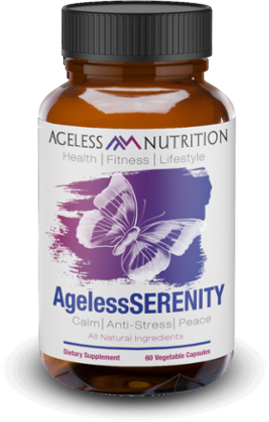 Because of the natural relaxation benefits of passionflower, we have used it in our AgelessSERENITY – Anti-Anxiety & Stress Relief supplement. We have also created a unique formula for sleep support by combining passionflower with other ingredients such as valerian root and melatonin. These ingredients can be found in our AgelessSLEEP – Natural Sleep Aid to help you achieve a healthy sleep cycle and feel well-rested in the morning.